Sota rules allow one summit activation (for the activator points) per calendar year, and the program runs to UTC time. In Australia we are lucky that we are 10(11)hrs in front of the UTC date line, our new years eve change over is 11am normal people time! SO.. I lined up the family for the fun of sitting on a march fly infested hilltop on a hot day for 3+hrs while I played radio, and they decided to go for a bike ride and swim in the river at the campsite instead and let me deal with the mountains. I set off from our campsite at around 9am after breakfast and coffee and headed to the nearest sota summit to where we were staying VK2/SM-053. This is an unnamed summit on what appears to be private property above the Crackenback valley, I had activated this summit new years day 2014 and was concerned that maybe it was private, however Rod, VK2TWR knows the owner, who is developing the hill as a housing estate, and is happy for our activations. A small amount of ground works/excavations has happened over the last 12 months, but essentially its the same as it was last year. As you head up the road, take the sharp road to the right almost at the top, the road you are on continues into what is essentially a dead end now (the old road has been blocked at the far end, replaced by the new more “sellable” main road! I parked near where I planned to activate and grabbed my gear, realising I had left the spare LOGBOOK sheets safely at the campsite – bugger!. Thankfully with the kids in the car packed for a road trip they have lots of colouring and activity books, and I found suitable book and ruler to make my own log sheets up. 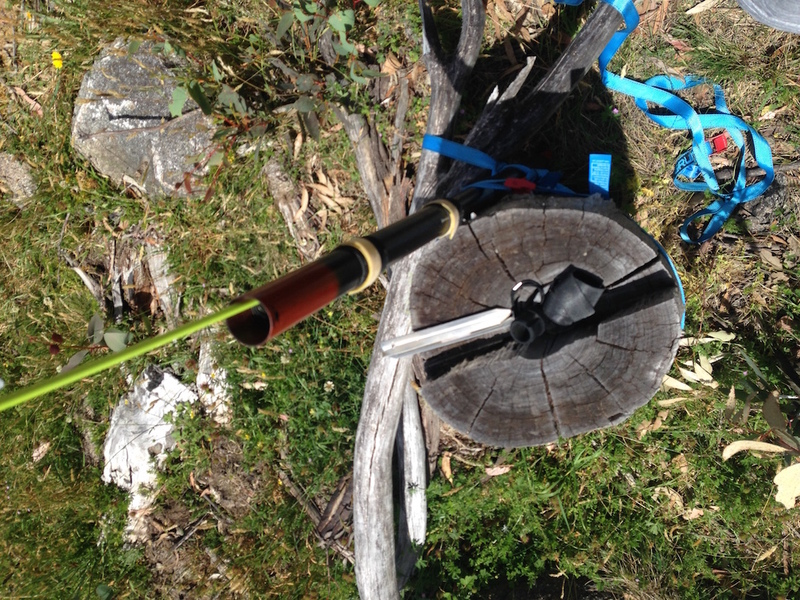 I then walked back down the hill, until out of the zone, then back into the one and set myself up on a work, using a tree stump to mount the antenna pole. 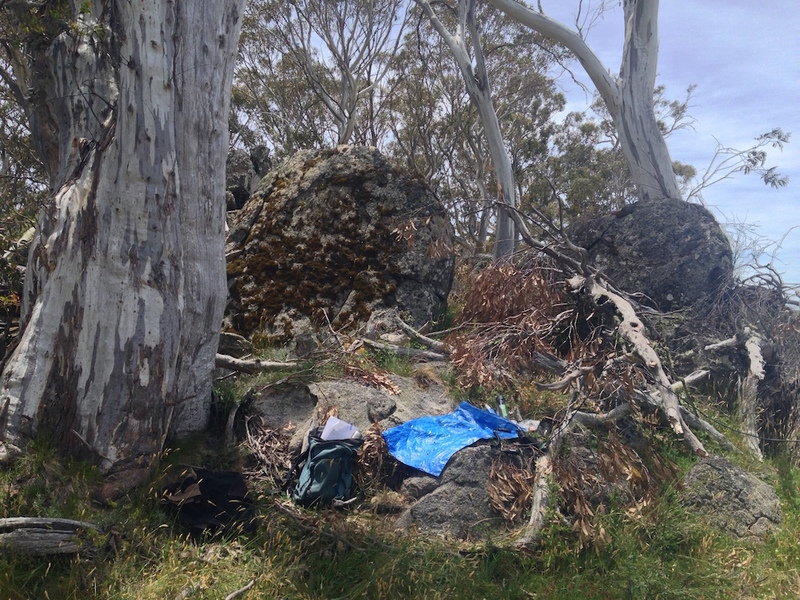 I had left a 2m/70cm HT back with Chrisitne, vk3fcek, and was able to work her on pre and post new years for her chaser points on fm (being in the next valley below the summit camping) as my first contact. I was ready to go before 10am. 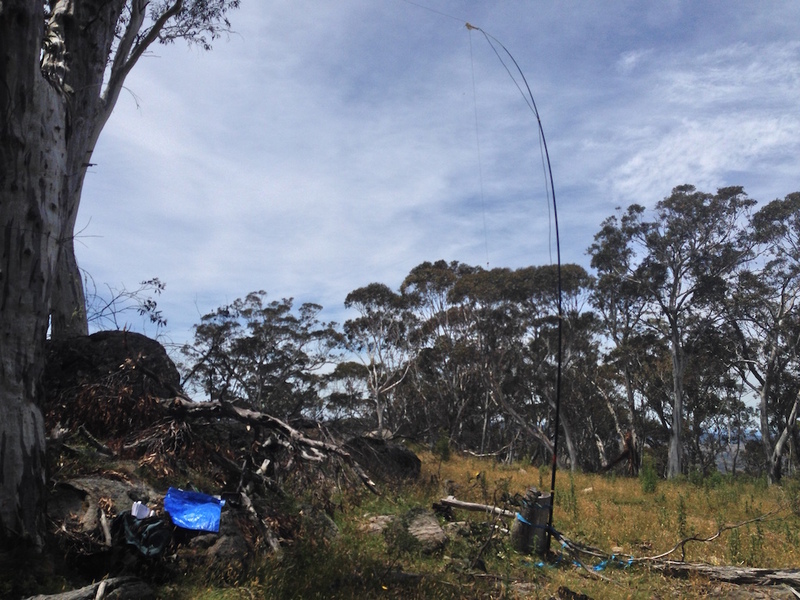 The march flies were out in force as i sat down and tuned to 40m. With so many people out on summits, i spent the first 15 mins working other summits before I found a clear spot and called CQ, the pre NY effort saw 37 contacts with 16 S2S contacts for 87 S2S points. The post new years effort followed a similar routine, chase some other summits then find a clear spot and call CQ for a bit until all the current chasers had been worked before moving back to chasing other summits and repeating the process. Post the change over I tried 6m SSB without luck (could hear the others who could not hear me, need to add that 6m leg to the link dipole! Before giving 20m a try and successfully working some VK6’s both on a summit and some chasers! The pace was pretty frenetic at times, with 3 contacts a minuet at one point, great to see so much activity, including new activators and chasers as well as the regular crowd. The post NY activation saw 49 contacts with 24 S2S contacts and 124 S2S points. By around 12:30 local I had exhausted all the chasers and other S2S operators and packed up working christen on FM telling her I was done and headed back down the hill. 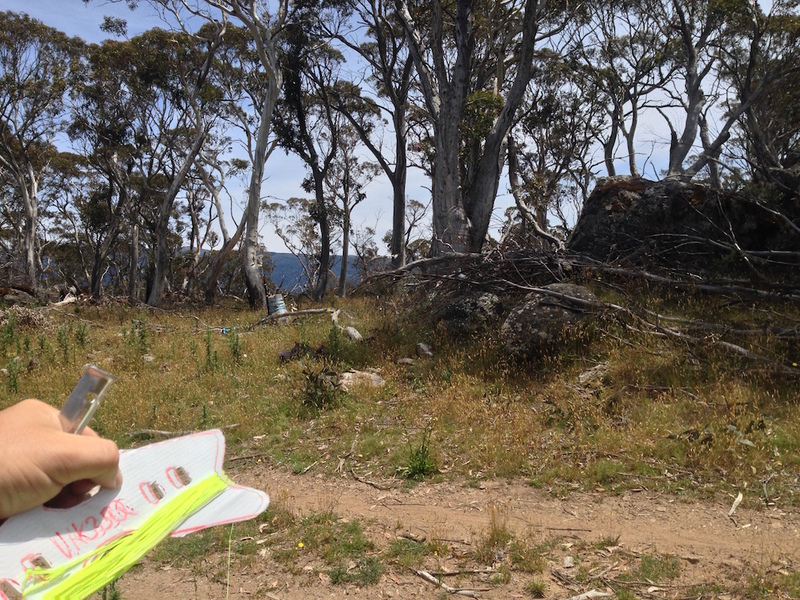 A quick stop in Jindabyne for a cool drink and I continued to another easy access summit south of Jindabyne, VK2/SM-065 Box Ridge. 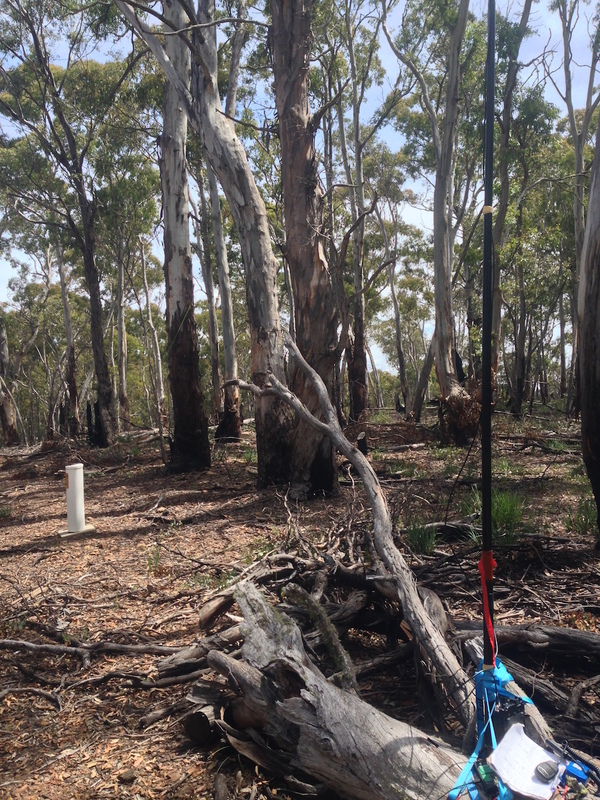 I’d operated VK2/SM-065 Box ridge earlier in the week with Christine and the kids, but this time was alone. I drove along the access road but didn’t meet anyone as Ian VK1DI had the previous day. 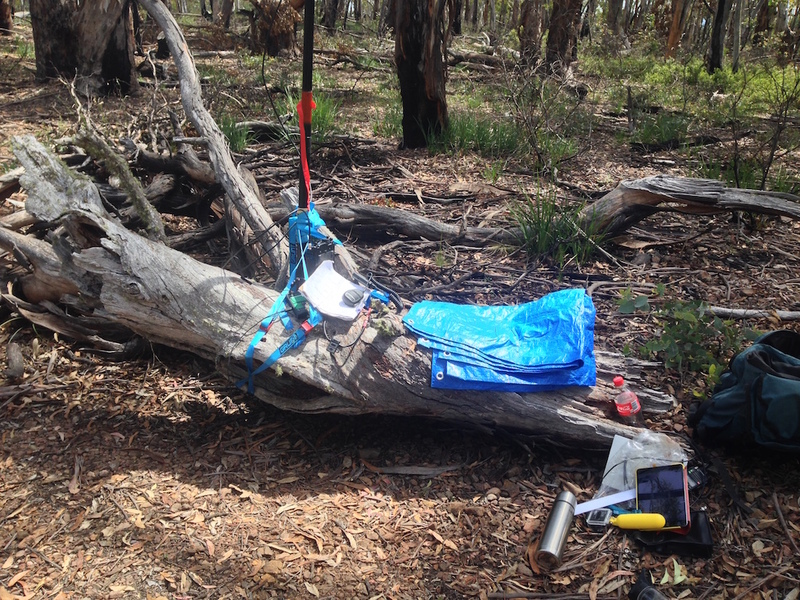 I parked near the cross road and walked down the left track outside the zone and back up to my tree stump id used the other day and setup the dipole. The operating procedure was similar to earlier in the day, with lots of people on summits and many on different summits, i chased S2S contacts for a bit before finding a clear spot and working chasers before hunting again, once again running 20m at the end of the activation to give the vk6’s and other distant stations some points. I tried 6m again but with little luck again, on to that 6m link dipole!. This activation saw 45 contacts and 21 S2S contacts and 113 S2S points. All up, 135 contacts, 10 Andrew to Andrew Contacts, 61 S2S contacts and 324 S2S / Chaser points in 4 ½hrs of activations and 8hrs of sota’ing. Thanks to everyone who helped make the day a success, the other activators and the chasers, without your efforts, the activity would be pointless! Bring on New Years 2015/2016. A final note, i had always manually entered logs via the sotadata website, but with SO many to enter, sat down with excel and created a .CSV file to upload the log file following the guide HERE the first log had some errors I corrected, but the 2nd and 3rd logs were fine. Once i re-read the instructors and discovered they needed to be in time order! (my log isn’t always written in time order!) Somehitng to use in to the future.